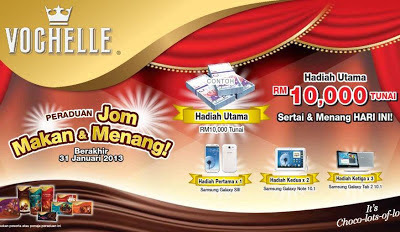 Purchase any Vochelle products in not less than RM20 in a single receipt. Send the contest form with the purchase receipt. Post the contest form by mail to: Peraduan "Jom Makan & Menang", Peti Surat 9012, Pejabat Pos Kelana Jaya 46803 Petaling Jaya. Visit Vochelle FB fan page for more details.